Fire extinguishers can be placed where it suits you best, but they must be spread evenly across the space. Recommended locations are corridors, stairwells, central entrance halls and near exits of rooms. This way, the escape route is the most protected. Extinguishers must be placed somewhere where they can be easily reached. Fire extinguishers must be legally placed in clearly visible places on suspension brackets or stands. They can't be simply placed on the ground, because they could be knocked over easily. People using an escape route have be able to see the extinguisher clearly. 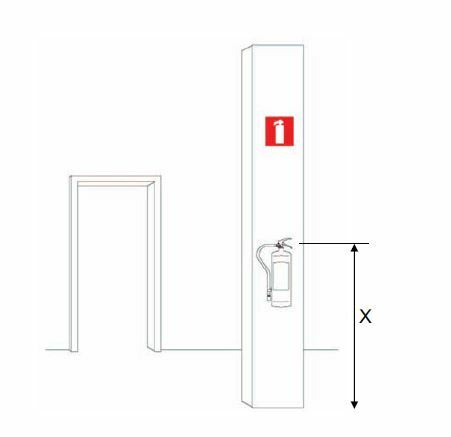 The location of the fire extinguisher must always be indicated by a pictogramme. The correct installation of a fire extinguisher looks like this. X is 1m max. for fire extinguishers of 5kg/l or more, and 1.5m max. for fire extinguishers weighing less than 5kg.